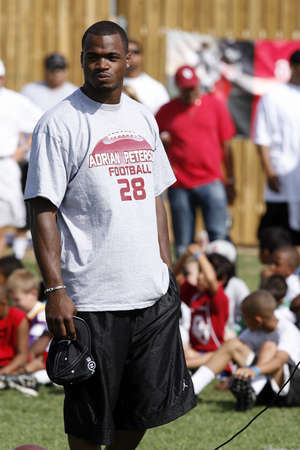 NORMAN, Okla. – Adrian Peterson sat down and smiled, posing for a picture among a dozen kids who'd signed up for the chance to learn some football skills from one of the NFL's top running backs. As the kids turned to head back to learning drills, almost every child aimed a tiny hand at Peterson looking for a quick high-five and a cherished moment with the Minnesota Vikings star. It's been that kind of week for Peterson, who had a parade in his honor in his Texas hometown over the weekend and got greeted by hundreds of adoring children at his first football camp on his old college campus at Oklahoma. Peterson built up a loyal following in three seasons with the Sooners and now finds himself getting recognized no matter where he goes after finishing second in the NFL in rushing and being honored as The Associated Press' Offensive Rookie of the Year. "It comes with the territory. 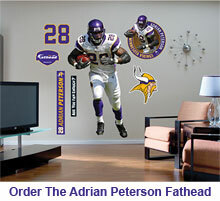 I just try to take advantage of it now and reach out to people, the youth, and just enjoy it," Peterson said Friday. "Enjoy the cake while it's on the plate. That's what I'm doing." About 500 children participated in the three-day camp, which featured a cameo appearance from New England Patriots receiver Wes Welker on Friday as the kids focused on learning receiving skills. Peterson lined up as the quarterback to toss a few passes to the participants, and then he and Welker fielded questions from the campers. Peterson told the kids his best friend on the Vikings was cornerback Marcus Walker, his roommate at Oklahoma who recently signed with Minnesota as a free agent, and took a jab by saying that the toughest team he'd faced was the San Diego Chargers – the team against which he set the NFL single-game rushing record with 296 yards. "That was a joke," Peterson told them before settling in on the Washington Redskins, who held him to 27 yards in the next-to-last game of the season. Peterson said his hope was to "inspire the kids that they can dream big and accomplish anything they put their minds to." Organizers said approximately one-third of the children had disadvantaged backgrounds and were attending through corporate sponsorships. Peterson also brought in 10 kids from Palestine, Texas, who won a drawing associated with the parade in his hometown last weekend. "It feels good to go back home and to see all the people back home supporting you, and just be around the kids and just go back home," Peterson said. Peterson, who in 2004 became the first freshman to finish as high as second in the Heisman Trophy balloting, ran for 1,341 yards and 12 touchdowns in 14 games last season. Included in the total was a 224-yard game against the Chicago Bears and the record-setting performance against the Chargers three weeks later. Together, he and backfield mate Chester Taylor combined for 2,185 yards. Peterson said someday he'd like to join the elite 2,000-yard club on his own. "I expect a lot from myself and I really feel like I would be cheating myself if I didn't set my bar at the 2,000 mark," Peterson said. "This year and next year and, God willing, until I retire, that's going to be my mark." Peterson said his primary interest, though, is helping the Vikings get better and he thinks they're getting closer with the pickup of Pro Bowl defensive end Jared Allen from Kansas City and the signing of former Bears receiver Bernard Berrian. "The ultimate goal is to get to the Super Bowl," Peterson said. "Any other individual goals, if you take care of your business on Sunday and Monday, then everything else falls into place."